Tangerines are a great fruit for adding essential vitamins and minerals (like vitamin C, folate, and potassium) and they're a great way to get a little natural sweetness in your day. 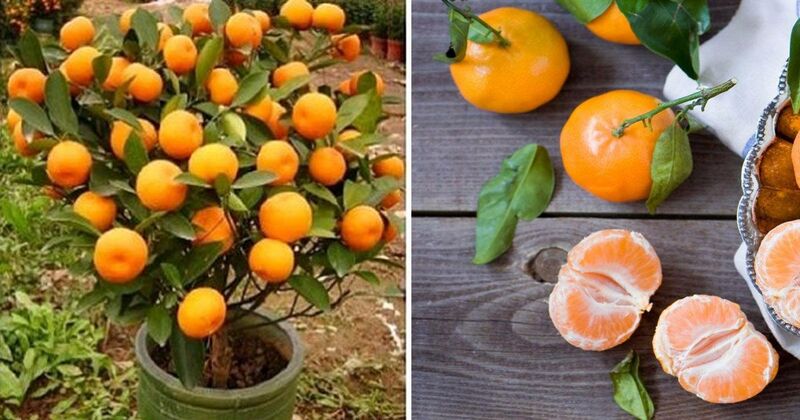 You can also grow this citrus fruit at home. Whether you're trying to save money in the grocery budget or you simply want to try your hand at gardening, this fruit is a fun option to try. Keep reading to learn three ways you can tackle this fruit on your own. 1.Grow it in a pot: Tangerines do really well in hot, sunny weather. So unless you live in a semi-tropical or tropical climate, you should plant your tangerine tree in a pot, according to Gardening Know How. Choose a medium to large size pot (so the roots have a little growing room) and choose a sunny location for your plant. Tangerines thrive on neutral soil so remove any excess peat from the roots before potting. For best results, opt for a sprouted tree over seeds (for better fruit production). Opt for dwarf versions of the tree if you choose to plant in a container. 2. In the backyard: If you're lucky enough to live in the right climate, you can grow your own tangerine tree in the backyard (or front yard). As with planting the tangerine tree in a pot, you should choose a sapling rather than a seed to start your crop. Choose a sunny location and dig a hole just bigger than the root ball, according to Backyard Gardening. Before planting, make sure the roots are loose (you may have to cut off any wrapping canvas and/or gently use your fingers to slightly loosen the roots from the ball). Cover with dirt and keep your tree watered regularly for a few months and whenever it's been more than a week since rainfall. 3. As a houseplant: You can grow tangerines from a seed, just know that the fruit this type of seed produces may not very tasty. The tree can make a pretty (and lovely smelling) decorative plant, though. As an added bonus: if your pets (or kids) nosh on the leaves, they'll be fine. The plant is non-toxic. The next time you buy a tangerine (or a lemon! ), cut the fruit in half and keep the biggest seeds you can find. For best results, you'll want to plant them as soon as possible to keep the seeds fresh. Fill a 3 to 4-inch pot with soil and plant all of your seeds about 1/2 inch deep. Moisten the soil and cover the pot with plastic wrap (this will keep the soil moist). Keep the pot out of direct sunlight. Once your first sprouts appear (it can take up to two weeks), remove the plastic and plant in a larger pot in a warm area with good sunlight. Water regularly, but be careful not to overwater them. Remember: patience is key. These plants grow slowly. Do you know anyone that would love to grow their own citrus plant? Make sure to share these ideas with them on Facebook. When starting to plan your garden for the upcoming spring, consider incorporating flowering plants and herbs. It might be hard to imagine planting flowers in place of your most-loved edibles, but the benefits are worth the sacrifice. Wondering if you have enough space to plant potatoes in your garden? If you have a sunny corner, just two feet by two feet, that's all the space you need!